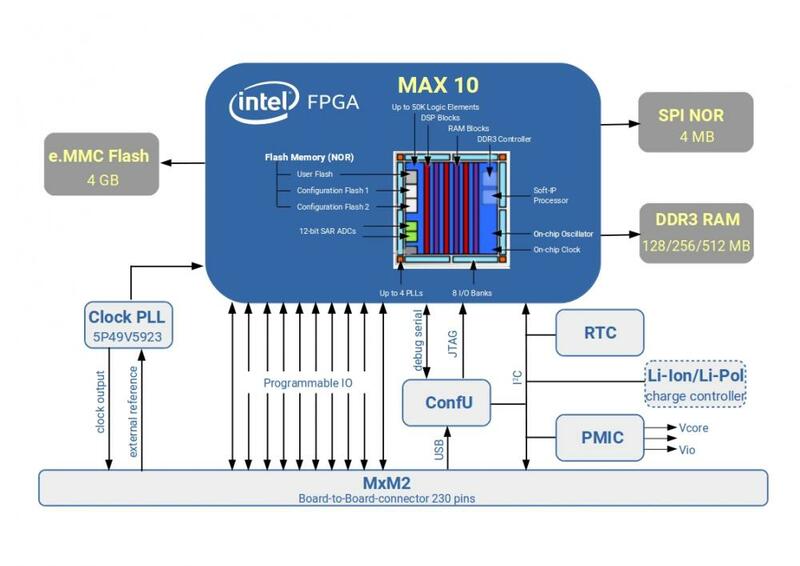 MX10 is a non-volatile and fully programmable SoM solution based on the MAX®10 family by Intel PSG. It incorporates advantages of MAX 10 FPGA such as instant-on functionality, integrated analog-to-digital converters (ADCs) and dual configuration flash. MX10 can be used with the standard baseboard (SpiderBase) as a complete building block or can be plugged into existing designs and products as functional part. It connects to its baseboard via a 230pins MXM2 connector and provides the ideal solution support for various soft-core CPUs, video-processing algorithms, etc. The module delivers full-featured FPGA capabilities including support for various soft-core CPUs, advanced DSP and video-processing algorithms as well as external DDR3 controller. While the SpiderSoM targets the area of IoT Maker applications MX10 was designed to be used in professional electronic designs in commercial applications.